If you have an extensive knife collection, then you know how important it is for you to keep them in pristine condition, which means that you have to sharpen them on a regular basis. Working with a dull knife can be much more dangerous as it requires you to use more effort to get the job done, which increases the risk of accidentally cutting or stabbing yourself. When it comes to sharpening, however, there are so many different ways to do it that it can be difficult to figure out which one is best. This is especially true if you have a large collection as it can take a lot of time to sharpen each one of them by hand. Fortunately, there is a better way. 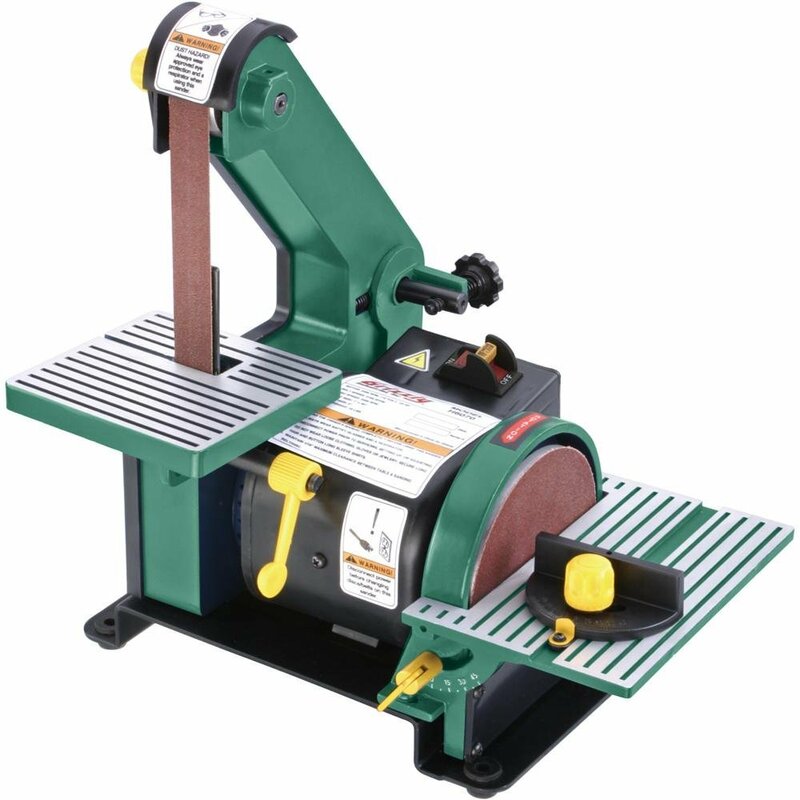 Using a belt sander, you can sharpen your knives quickly and efficiently, as well as safely. While it does take a bit of practice to master, using a belt sander is fast becoming the go-to method for knife owners and collectors. Today we’ll see why that is and show you some of the best at-home belt sanders you can use. Why Use a Belt Sander for Knife Sharpening? One of the main reasons that people like to sharpen with a belt sander is that it’s so much faster than traditional methods. Because the sander operates at high speeds, you can get a pristine edge in a fraction of the time it would take using a whetstone or sharpening tool. Another primary advantage that belt sanders have is that they create a convex edge to the knife, rather than a concave one. That means that you are shaving off less metal and leaving behind a razor sharp finish that will last longer overall. When it comes to power sanders, Kalamazoo is one of the better known and respected brands out there. Although the name is a little funny, the company takes pride in making high-quality devices for woodworking. That being said, this is not technically a sharpening sander, but you can easily adapt it for your needs. This model comes with a ⅓ horsepower motor and operates at 1,725 rpm, which is more than enough to sharpen your knives easily. Technically speaking, the motor is reversible, but we don’t recommend that you do that with sharp objects, unless you want to injure yourself. The contact plate on this model is four inches, which makes it ideal for smaller knives, but not large ones like kitchen knives or anything like that. The plate does tilt, but you will have to manually adjust it so that it can go all the way to forty-five inches, so keep that in mind. Essentially, you are rigging this woodworking sander to sharpen knives, so be prepared to do a little elbow work at first. Next, we have another high-quality brand name that makes some of the best belt sanders in the business. In this case, the H6070 from Grizzly is a 2-in-1 model that allows you to use either a belt or a rotating sander to fit your needs. Technically speaking, this is another woodworking machine, but you can easily adapt it to sharpen knives. If you are looking for a versatile device that can perform a wider range of uses for you, then this is the way to go. As far as power goes, this model comes with a ⅓ horsepower motor and operates at 3,450 rpm, which is about as high as you want to go for sharpening steel. As we mentioned, you get both a belt and a rotating sander, which means that you can use the rotator as a buffer if you want to. Best of all, both sides have a work plate that bends up to forty-five degrees, making them ideal for sharpening or grinding. Also, the plates are extra wide so that you can work with all kinds of knives. Another great feature of this sander is that it comes with a dust port to collect your dirt and debris. While this is mostly helpful for woodworking, it can come in handy when sharpening as there will be tiny bits of metal shavings that come off. 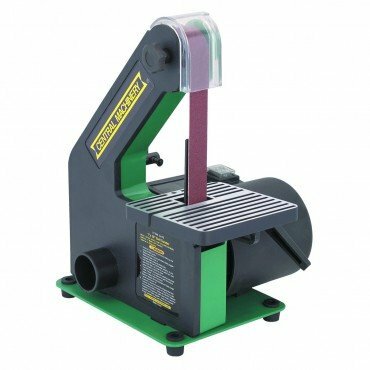 While the Grizzly Sander above was designed for woodworking, the G1015 is suited specifically for sharpening knives. That means that if you want something that will give you the best edge possible, this is a fabulous option. What makes this sander so great for sharpening is that you get more power and torque from the motor, but it doesn’t operate at such high speeds, thus enabling you to have more control over your work. One horsepower and 1,725 rpm are perfectly suited for the job, making this one of the best sharpeners we’ve seen. Also, to make sure that everything runs smoothly it comes with all ball-bearing construction. Finally, one feature that stands out is an auxiliary arbor on the side. You can attach a sanding drum or a buffing wheel to this component to make your sharpening process much more streamlined. If you already have a bench grinder, then you may be wondering if it’s necessary to buy a whole new machine just to sharpen your knives. Fortunately, with this MultiTool Attachment, you don’t. One thing to keep in mind with this product is that it is only designed to work with bench grinders, so if you don’t have one then you can move on down the list. Also, if you have a unit with heavy cast wheel guards, then this attachment won’t work either. So, assuming that you have all of the necessary components, we can talk about how this attachment will make your sharpening go so much easier. 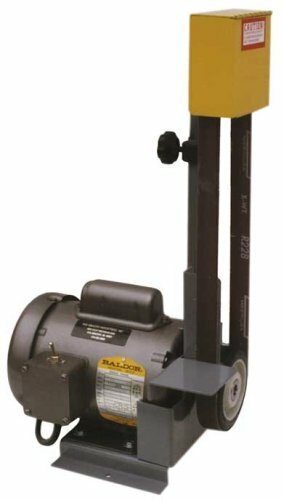 This device works with a flat platen, contact wheel, or slack belt depending on your needs. There are also two sizes available, which can be either two or four inches. Overall, this attachment is ideal for sharpening, shaping, cleaning, and polishing your knives (or other metal objects). Best of all, you can change belts quickly in a matter of seconds. 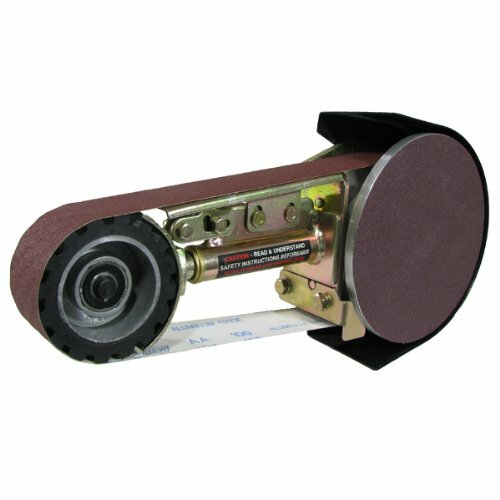 Our final device is a standard belt sander from Central Machinery. This is yet again a machine that is built with woodworking in mind, but you can easily adapt it to fit your sharpening needs. This device has a ? horsepower motor and operates at 3,400 rpm. That is on the high side, so make sure that you are careful when working with this machine as it is much faster than other models. Highlighted features of this unit include an adjustable belt tracker, a work plate that tilts up to forty-five degrees, and a dust collection chute to make cleanup even easier. Finally, it comes with rubber feet for stability and an incredible 100% money back guarantee. As far as sharpening belt sanders go, we have to say that our favorite machine is the Grizzly G1015. We like the fact that it is specifically designed for sharpening knives, meaning that you get the best performance and don’t have to change anything about the machine itself before you start working. We also appreciate the auxiliary arbor so that you can buff and shine your knives as soon as they’re sharp, making the whole process seamless and efficient. When looking at different belt sanders, you’ll notice that they use horsepower as a measurement for the motor. While having higher horsepower does mean that you can do more work with the machine, you also have to pay attention to the rpm. 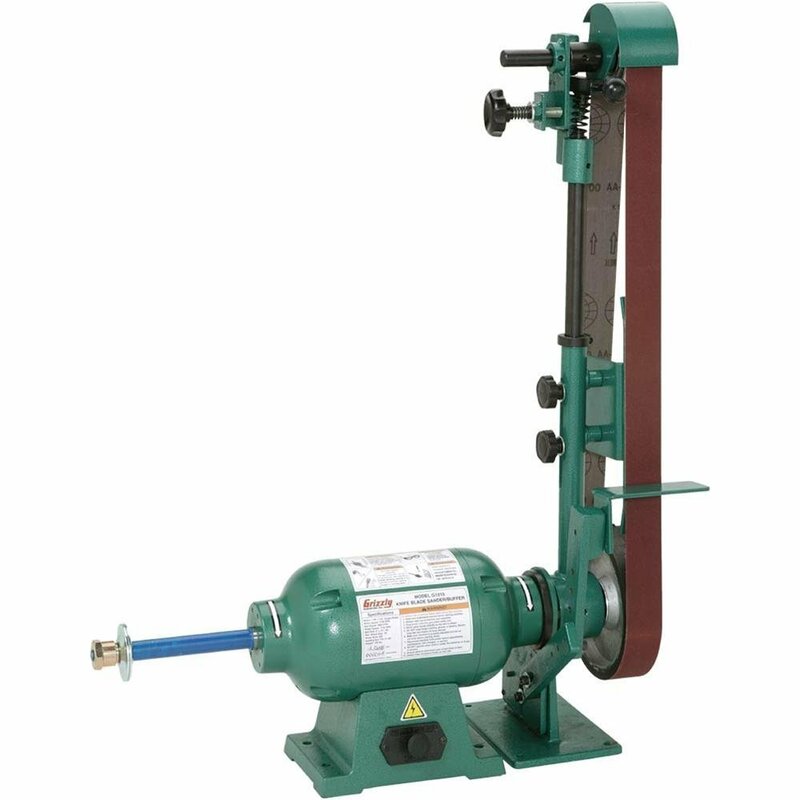 Because the belt sander is spinning so fast, the more rpm you get, the better off you’ll be with sharpening. As a rule, you want to get something that has at least ⅓ horsepower and 1,725 rpm. Any less than that and you could risk damaging your knife. Also, don’t get a model that is too fast, either, as you could lose control of the knife if you’re not careful. When referring to size, there are two things that you should be looking at overall. The size of the machine itself and the dimensions of the sandpaper it can use. When looking at the machine, you want to make sure that it can fit on your workbench or garage space with ease. Some units allow you to bolt them to the table, while others come with rubber feet for added stability. The other thing to consider is the weight. If it’s too light, then you could risk moving it on accident while you work, which could be a disaster. However, if it’s too heavy, then it will be hard to get it into place or move it if necessary. As far as the belts are concerned, you want to make sure that you’re getting the right belts for the machine. Most sanders will take belts that are either one or two inches wide, but the real difference is the length. Depending on your model, the belt could be as short as thirty inches or as long as 76. The size of the belt doesn’t really matter as far as sharpening ability, but just be sure that when you buy replacements that they are compatible with your machine. To get a proper edge on your knife, you have to hold it at an angle. If you tried to sharpen it while holding it flat against the belt, you would get a flat-edged knife. However, it’s impossible to hold it at the exact angle while you’re working unless you have a work plate on which to set your knife. These plates usually tilt, but you have to make sure that it can move up to forty-five degrees up so that you can sharpen your knives properly. If it does any less than that you are going to dull the blades. If you’re going to get a power sander in your garage, then you might as well use it for other things besides sharpening, right? Usually, these devices are made for woodworking, but some are specifically designed for knife sharpening. If you want to get some extra mileage out of your sander, then get one that is made for woodworking and then adjust it to fit your needs. As long as you use fine grit paper (800 and above) and have a work plate that tilts up to forty-five degrees, you’re golden.